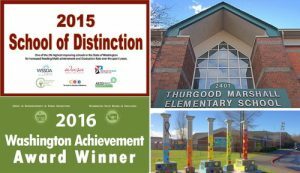 Some images relating to Thurgood Marshall Elementary! The School won a 2015 Washington School of Distinction Award, which goes to schools in the top 5 percent of raising academic achievement over the last 5 years. TM also won this award in 2014, 2013 and 2012. The School won a 2016 Washington Achievement Award (top 5% of Washington schools in certain measures of student improvement five years in a row). This year’s win was in the “High Progress” category; in 2015 for, progress in English Language Arts; in 2014, in the “High Progress” category. The other images are of our front door atrium and of “Pillars of Diversity,” an art installation created in 2015 on the eastern part of our campus to honor the late Justice Thurgood Marshall.